Virginia (Duncan) Dall is our lead instructor for the personal protection inside the home (CCW) class. Our class is one day a week for five weeks. Each session is three and one half hours. 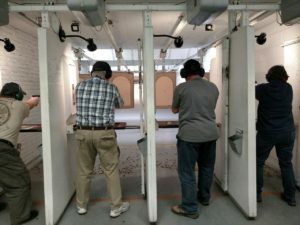 The morning class runs from 9:00 A.M. -12:30 P:M, and the evening class runs from 6:30 P.M.- 10:30 P.M. We begin with the NRA basic pistol safety class, and proceed into the CCW class. You shoot our guns 4 out of the 5 weeks. Jeff Stroud from the Bay Co. Prosecutors Office is given one evening during the class to present the legal part of the class and answers questions. The Fee for the class is $160 which includes the use of our guns and ammo. Eye and ear protection is required and may be purchased before the class. We will post the next scheduled class on the events schedule. Registration can be done in the shop, or with a credit card over the phone. The video is 3 hours and the range time is 1 hour so allow 4 1/2 hours. Bring pop and popcorn or coffee and cookies. The 41$ fee covers Range time, , and certificate of completion. This is a family oriented competition. It is shot with 22 cal. pistols, or rifles with or without optics. You can use your gun or ours. If you use our gun, you must purchase the ammo here. 100 rounds/$8.00. The course of fire is steel plates and is shot against the clock. you shoot the course 5 times (50 rounds) and throw out the worst score. There is a penalty for missed targets. The four scores plus penalties are added together for your final score. The course is easy and is ideal for anyone just starting shooting competition. Our range officers will talk you thru each step of the match. You can shoot the course as many times as we have time for. © 2018 Duncan's Outdoor Shop, Inc.